I’ve been helping a friend of mine, Amy D, with swimming for her first triathlon and I wanted to write down some more tips for her to use during the race. And then I thought it would be a great opportunity to start a series on triathlon on the blog for any beginners who are thinking of doing their first! Now, I’m not an expert by any stretch of the imagination, no matter how PRO I look in pics, which is very. But I have been doing tris for awhile now and have done many races, so I can offer a few tips on getting through the race and how to get started in the sport. Being your first triathlon, you’ll want to stick to a short-distance race – most people elect to start with a sprint. This can be anywhere from a 300 to 800 meter swim, 10-15 mile bike, and usually ends with a 5K though the run distance can vary from 2-4 miles. Another option would be an Olympic, or international, triathlon. This is a 1.5K swim (almost a mile), 40K bike (almost 25 miles), and a 10K run. A little harder for a first tri but not unmanageable if you have the time to train. Now that is a fine mode of transportation if I say so myself. It is also Charlie-approved. The only other big dollar thing you MIGHT need is a wetsuit. Living in Texas, this is sort of a non-issue if you’re just starting out – not only are wetsuits not needed during the summer races, but they are not legal most of the time because the water is too warm. The water has to be a certain temperature to make the race either wetsuit optional or wetsuit legal. Wetsuit optional might mean that you won’t be eligible for awards if you choose to wear one. IMTX was wetsuit optional last year, but those choosing to wear one essentially had to take a 10 minute penalty. Wetsuit legal means everyone can wear one no problemo. I have a sleeveless wetsuit as well as a long-sleeved one for tris with colder water temps – Oceanside, Kemah, Oilman, Galveston, US Open. The rest I have done suitless! Easy. What do I wear during the race? A tri suit, commonly referred to as a “kit,” is ideal because you can wear it throughout the race. 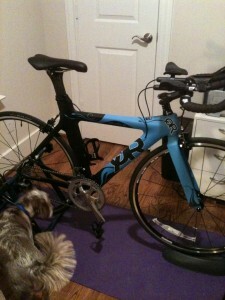 Go to a local bike or tri store (Bicycle World or Tri on the Run here in Houston) and they can help you out. The shorts have a small chamois in them, enough to provide some padding on the bike but not so much that you need to squeeze it out after the swim (that would look a little awkward…). OR you can wear a swimsuit during the swim and toss on bike shorts and a cycle jersey or tech shirt in transition. Most bike shorts have a bigger chamois though, which can make the run a little awkward. But if you’re not worried about your time (as you shouldn’t be for your first) and are willing to make a few wardrobe changes in transition, bring your bike and run shorts and a tech shirt to put over your swimsuit and you’ll be good to go. What the hell is transition? There are two transitions in a triathlon, as you’re preparing to go from one leg to the next. T1 follows the swim and T2 follows the bike. When you arrive at the race you’ll find out where you need to set up your stuff. You’ll get a small area (underneath a neighbor’s bike) to set up your all your crap – we’ll cover this in a later post. Transition times can make all the difference in the world – every second counts in a sprint. I qualified for USAT Age Group National Championships by placing 4th out of 46 in my age group at Tri Girl last August, and I’m convinced it’s only because my transition times were so good. I beat the girl in 5th place by 59 seconds. My T1 was 1:04 and T2 was 0:51. Her T1 was 2:04 and T2 was 1:56. I’m telling you, don’t discount transition. I mean, I’m not going to go to Nationals anyway (obviously, it’s in August) but it was nice to qualify and I wouldn’t have if I had been a little slower in transition. Ok, I have all this stuff. Now what? Now you have to train! In the next few posts I’ll cover each leg and some things you can do to prepare yourself for the race. You might need to join a gym with a pool or find a lake that you’ll be allowed to train in for open water swimming. Tri (see what I did there?) 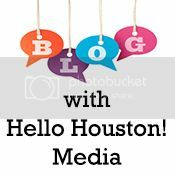 joining a local tri team – here in Houston we have Houston Racing Triathlon Club, as well as the ladies’ and gentlemen’s teams Sports Bra Slingshot and Jockstrap Catapult. If you want to train for a specific race, look into Team in Training – that is how I and many of my friends started triathlon! The Nation’s Triathlon in DC is one of the events being offered this fall! Joining a local tri team will give you a group of people to meet up with for weekly rides, runs, and other workouts. It’s always easier to go with a group than to tri (I did it again) to motivate yourself to go for a brick workout (we’ll discuss bricks later too!). **Get ready to make it rain in general. This sport is not cheap. Sprint triathlon entries will run about $65-$100, and the prices goes up as the distance gets longer. 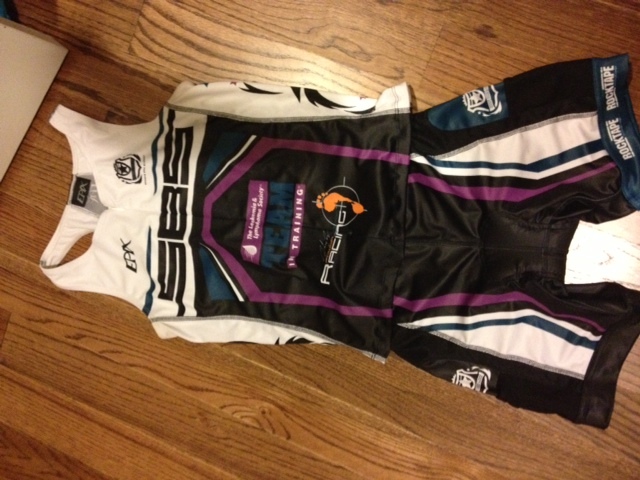 Dang…NOT fair with those new tri suits for TNT. LOVE THEM! Maybe I need to do another tri with y’all to get one hehe JK Sometimes I wish there was just a swimming event. lol I LOVE Honey Boo Boo by the way. I call my kitty…Kitty Boo Boo hehehe Love ya. This was VERY informative for a newbie. 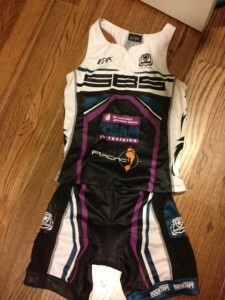 Good luck to your friend, Amy D.
It’s the SBS/TNT kit!! You should def join the social tri club AND do another tri w/TNT for sure!! I love peer pressure, hahaha. You know this. Hahaha, Kitty Boo Boo! So cute. Thanks for sending the luck to Amy! 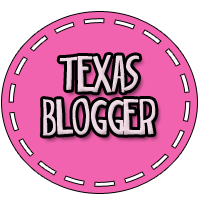 I love reading your blog, sister FAB tri tips!! Previous post: Weekly Workouts – knocked up edition.